I was born into the world while my mom meditated on a photograph of a mountain – so, perhaps my destiny was sealed at the moment that I took my very first breath. I sometimes wonder if that mountain photo is the first thing that I saw. The mountains have always been the place where I feel the most like myself – they are a place that does not judge me, but rather, embraces me exactly how I am. As a child, I was always outside – I could never explore or climb enough. I started playing violin at age 4, and I spent most of my time practicing or writing stories about children in the wilderness. To say this was an obsession is somewhat of an understatement. My parents gave me an old fashioned typewriter (you had to use two fingers to press down a key), and I spent hours writing stories and dreaming about all of the adventures that I could have in my life. I was severely bullied as a kid, but there was something about being in the wilderness that felt safe – it has always been the place that has reminded me how strong I am. It has always been the place where I can simply be me. When my bow touches the strings on my violin for the first time, I am bringing music to a place where it has never been before. Each concert is a celebration of a new day – a day that includes me. When you realize what a gift that is, it places you into such a deeply appreciative place of true gratitude. 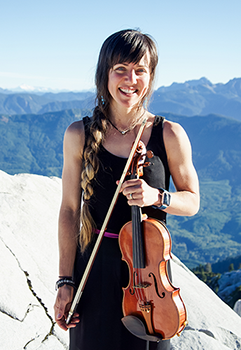 Prior to forming The Musical Mountaineers with my friend Rose Freeman (piano), I spent nearly 20 years paralyzed by the fear of pursuing my dreams, and now – I am brought to tears each time I have the opportunity to play my music in the mountains. It is such a relief when you realize that you never have to be anybody different than exactly who you are. 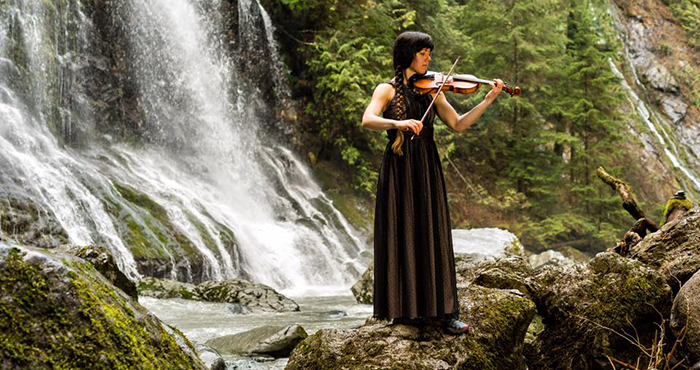 Anastasia’s version of “rugged elegance” includes a violin, a formal gown and a pair of Topos! I’m so excited for a full summer of Musical Mountaineering adventures, and I’m even more excited to have my Runventure 2 shoes along for the ride. Little known fact: on our first musical mountaineering adventure, Rose and I actually debated whether or not we should change into gowns – we thought it might seem stupid to wear them in the mountains. Being classically trained musicians, we both agreed that performing for the entire Cascade Mountain Range was the most special audience of all – we decided to put the gowns on at the last minute. I know that Topo didn’t design their shoes to be worn with a gown, but I am so in love with how they look peeking out from under the layers of soft tulle. Rugged elegance at its best!